When I first moved to Mallorca the island’s sheer beauty was a shock to me. Along with so many other visitors I had an image of Mallorca as one big holiday resort yet this is so far from the truth. The 30km of coastline on either side of Palma is by far the most developed by the holiday industry whilst the interior remained for many years a mainly agricultural area untouched by tourism. Today Mallorca is better known as a destination for everyone. The major resorts of Magaluf and Palma Nova remain top destinations on the southwest coast whilst Puerto Pollensa and Alcudia in the northeast and Cala Millor on the east coast are centres of large scale tourism. Rural tourism has grown considerably and there are hundreds of old Mallorcan farmhouses scattered around the countryside which attract a different type of visitor than those heading for the resorts. If you’re interested in getting to know what the guidebooks call the ‘real Mallorca’ then you should consider renting a car and heading out into the countryside. Below we’ve listed nine day trips you should consider which depart from Palma de Mallorca. The East coast of Mallorca is an area of great beauty. It consists of hundreds of small coves stretching its entire length from Cap de Ferrutx near Cala Ratjada in the north to Punta Negra on the island’s most southerly tip. The greatest concentration of these quaint coves which are easily accessible lie to the south of Cala d’Or where highlights include the national park of Mondragó and the beaches at Cala Figuera and Cala Santanyi which have long attracted artists from around the globe. Inland from the coast rural life continues in the small villages unperturbed by the tourism boom which has changed the face of the island over the past decades. The biggest tourist development is the resort of Cala Millor which has long been a favourite for German visitors attracted by its fine, long, sandy beach. Although plenty British visitors also head there in the summer months it is neighbouring Cala Bona which has tended to be the resort of choice for the UK market. Up and coming resorts such as Calas de Mallorca are well behind these established destinations in terms of tourist facilities. Practically every visitor to this coast visits Porto Cristo at some point during their stay. Not only is this a beautiful little coastal town in its own right but is also home to the famous Caves of Drach which are one of Mallorca’s main tourist attractions. The town’s aquarium is another popular attraction and the lesser known Caves of Hams on the outskirts of town heading towards Manacor are just as impressive as the Drach Caves. A third cave structure worth visiting is the Cuevas de Arta which lies near the beautiful beach of Canyamel some 7km from the town of Arta in the north. For golf enthusiasts there are five golf courses along this coast which are all very accessible. In the central section of the coast head inland from the lovely town of Porto Colom towards Felanitx then take the road for S’Horta. This will bring you to the Vall D’Or golf course. The other four courses are located very close to one another just inland from the northern part of the coast at Capdepera, Canyamel, Pula and Son Servera (see Mallorca golf courses). Mallorca’s north east coast doesn’t have the same number of quaint little coves the length of its coastline like the east coast. However, it does have long, sandy beaches, plenty beauty of its own and three of the islands main resorts. Geographically speaking, this north east coast stretches from the inaccessible Cap de Ferrutx which is a beautiful sight from the beach of C’an Picafort as far as the Cap de Formentor which is on the tip of the Formentor peninsular on the island’s most northern tip. The first major resort of note coming from the east is C’an Picafort which lies in the centre of the Bay of Alcudia. The resort is mainly popular with German tourists although there is a wide selection of nationalities during the peak summer months. It stands on a long beach which stretches uninterrupted to join the beautiful Platja de Muro and the Platja de Alcudia which only ends at Alcudia Port. Alcudia is the largest and most cosmopolitan of the north east coast resorts attracting many nationalities and catering to them with a fine selection of international restaurants including a fine selection of Mallorcan eateries. Its port area is particularly attractive for nightlife which is mainly geared towards mature visitors rather than the partying 18-30 crowd. The actual old town of Alcudia is a walled Roman town just 2km from the port. Beyond Alcudia the Bay of Pollensa leads to the popular resort of Puerto Pollensa. A well used cycle path connects the two places. Puerto Pollensa is a well established tourist destination which has long been a favourite with the British market. It is a low rise resort which caters for all nationalities and is the stepping stone to the beautiful scenery of the Formentor peninsular and the whole Serra de Tramuntana mountains which stretch the length of the north west coast of Mallorca. The inland town of Pollensa is worth a visit where local Mallorcan restaurants serve up some fabulous local meat dishes. In an era of activity based tourism this coast has much to offer the visitor. Alcudia is the main centre for cycling holidays in the region attracting thousands of cyclists to its bicycle friendly roads with their spectacular scenery. Even the casual cyclist can rent a bike here and enjoy many hours cycling along the specially designated cycle tracks which lie next to many major roads. Birdwatchers are in their element here, especially when visiting the Albufera nature reserve just south of Alcudia. And for walkers the opportunities in the mountains above Puerto Pollensa are numerous with a good range of well marked paths. Heading into the Tramuntana of the north west coast provides many more walking routes for all levels. Just pick up a book of recommended walks and you’re in for a treat. Golfers head for the Alcanada club just west of Alcudia for a beautiful course surrounded by sea and countryside. Mallorca’s north west coast is more commonly referred to as the Serra de Trasmuntana which is the mountain range stretching the length of the coast from Port de Pollença towards Port d’Andratx. If you rent a car in Mallorca and decide to drive the full length of this coast I can assure you that it will be added to your personal shortlist of ‘best drives ever’. The scenery is beautiful as you wind your way along the C-710 towards the monastery at Lluc which is your first port of call. There’s plenty parking next to the monastery and no charge to have a look around the island’s most sacred site. There are a few cafés and restaurants serving quite decent Mallorcan dishes and light snacks. Just beyond Lluc look out for a right turn to the small port of Sa Calobra which takes you onto a 12km road full of hairpin bends. From the car park it’s a 600m walk through several tunnels to the Torrent de Pareis which is a beautiful cove with great places to go for a swim. Unfortunately, the place is mobbed during the summer with day trippers making the drive fairly unpleasant in both directions. Touristy meals are available in the cafés on the seafront. Once you’re back on the main road follow signs for Soller. Look over to your right as you’re approaching the Gorg Blau reservoir and you’ll see Puig Mayor which is Mallorca’s highest peak at 1445m. Shortly before arriving in Soller take the left turn for Fornalutx, a village which claims to be the most beautiful on the island. Well worth stopping in one of the nice restaurants here for lunch or for a snack in the square beneath the village clock. Continue on to Puerto de Soller via another pretty village at Biniaraix. The Port de Soller has a large bay looking out to sea and lies just 3km from the pretty town of Soller. The scenic train excursion from Palma to Soller stops in the town then visitors transfer to a tram that takes them down to the port. If you fancy treating yourself stay the night at the 5 star Gran Hotel Soller and continue your journey the following day. Head out of Soller town on the C-710 heading for Deia. Beautiful coastal scenery suddenly appears to your right as you wind your way through the hills. Pull over in Deia and take a stroll up to the old village church where the English writer Robert Graves is buried then stroll along the main street where there are plenty places for refreshments. Next stop is the picturesque town of Valldemosa which is famous for its monastery where the composer Frederic Chopin and his lover George Sands spent an unpleasant winter in 1838. Heading back out of town take the turn for Port de Valldemossa which is a 6km drive of hairpin bends which eventually reaches a little bay with a single restaurant overlooking what can be wild seas on windy days. The rest of the drive meanders through lovely little villages such as Banyalbufar and Estellencs before reaching the end of the Serra de Tramuntana at Andratx. Look out for signs for viewpoints along the road which give you superb views along the rocky coastline. Just west of Andratx is the idyllic little town of Sant Elm which is a great spot for a seafood lunch overlooking the island of Dragonera. The south west coast of Mallorca surrounding the Bay of Palma is the island’s main area of mass tourism. Whilst Cala Millor on the east coast and both Alcudia and Puerto Pollensa in the north are significant resorts, it is the resorts of the south west that made Mallorca famous as a package holiday destination. Magaluf and Palma Nova are the top destinations for British tourists on this coast. Both resorts are well established and offer all you’d expect from popular package holiday resorts. The beaches are excellent, there are many thousands of hotel and apartment rooms and a varied supply of bars, restaurants and clubs to suit every taste. Santa Ponsa is a little further west and is another resort which particularly attracts British tourists. Nearby Paguera is a lovely spot where tourism is geared predominantly to the German market. This is the end of large scale tourism on this sector of coast as you reach Port d’Andratx which is the stepping stone to the beautiful west coast of Mallorca and the Serra de Tramuntana which are described above. Just east of Palma de Mallorca city and right next to the island’s airport is C’an Pastilla which marks the beginning of the 6km sandy beach known as Playa de Palma. This culminates in the small resort of Arenal at the beach’s most easterly point. Quite a number of British tourists go to Can Pastilla and less to S’Arenal whilst the main area of Playa de Palma is mainly frequented by German package tourists. For a good package holiday this sector of coastline around Palma has plenty to offer. However, if you want to escape from your resort you can easily rent a car and head out to discover the magnificence of this beautiful island. Have You Toured Around Mallorca? If you’ve driven around Mallorca we’d love to hear from you. Do you have any useful recommendations for readers which I haven’t mentioned? Any quaint places to stay or nice places for lunch? Just tell us your tips and experiences in the comments box below. Hi Jeanette – Perhaps a reader here might be able to help you? We’ve spent 7 days in Ses Illetes in mid September, excellent hotel, excellent food, especialy ensaimada very tasty. great wines of Binissalem – I’ve tried Jose I Ferrer. Have visited Palma , Valdemossa, la Granja, Soller city and port and I’ve seen the show Es Foguero. Everything was great. I’ll never forget the landscapes, and of course the best oranges in the world. I used to live there many years ago when it was called Illetas, now everywhere has taken the Mallorcan spelling. Beautiful spot. I spent a week in Palma the lifestyle liked me very well. There is Cap Formentor, indeed a delightful place. On the way from Puerto Pollenca to the town of Pollenca turn off to the right, follow the road along for about 2 miles and you will come out at one of the nicest places on the Island. Cala San Vicente. The coves are sandy and the view is breathtaking, especially as you follow the road around to Cala Molins. Each year we go back there and it is like coming home. I wish I was there! My parents lived in Palmanova for 25 years and I lived there for about 3. My favourite moped rides were to Sant Elm and Puigpunyent. Really enjoyed your comprehensive tour of Mallorca. We visited Cala d’Or about eight years ago and loved the sheltered sandy bays and port area. The Drach Cuevas were also very impressive and well worth a visit along with Porto Cristo. Palma is superb and if the ‘Pirates’ show is still showing in Magaluf, it shouldn’t be missed! The Playa de Palma was probably the longest beach we have ever seen and a great choice of German restaurants! Pirates show is indeed still showing and remains as popular as ever. Love Mallorca and have been going twice a year since 2004, just love exploring the Island, always stay in Cala D’or, thanks for your latest info Gerry will try that drive when we go in October. Very intriguing. A lot of thought and information has been put on this page with maps and photos. I did not know that there was an Island East of Valencia, Spain that would be a great place to explore by car. Now I want to go there, but for now I will have be content to just read and follow along with the author. Another outstanding virtual tour. Gerry could you tell me if roads are suitable for medium sized motorhome to tour around? Thanks for a great article. I’m sure you’d be okay taking the main roads around the coast and the ones through the centre. I imagine you’d struggle on some of the local roads in the interior. 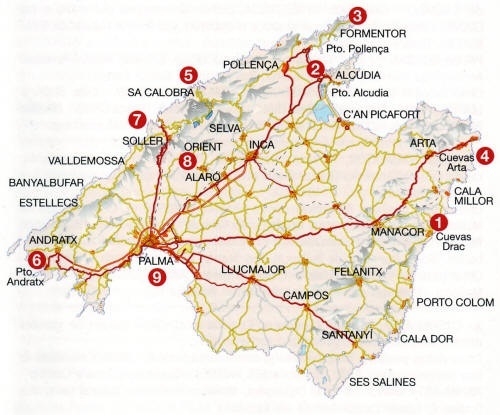 Also bear in mind that there are few (if any) campsites in Mallorca so you’d be very restricted in where you can stop. As a teenager in Glasgow in the 50s EVERYBODY was going to Mallorca and so I never wanted to go, but you make it sound enchanting. I bet you enjoyed “researching” this great article! Thanks. As Liz mentions above … it’s “a much maligned island”. The media love to bring us all the tacky news in their ‘Mallorca Uncovered’ type articles but not often enough do they report the stunning beauty of this fabulous island. I’ve been fortunate enough to be able to travel all over the world but when asked of my favourite places Mallorca always gets in their somewhere. Give it a try, you’ll love it. Thank for this very useful information. I have not visited many areas outside of the main tourist spots but I will try to in the future. Agree, a lovely island. Or as an elderly lady i was talking to who had had a holiday home there for many years called it – ‘A much maligned island’ . Good information. When is the best time to visit, weather-wise and people-wise? Well that depends entirely on what you’re looking for. The hot weather is of course most guaranteed during the summer months of mid-June to the end of August but this is also the time when most tourists are visiting. Many winters are very mild with relatively few visitors but these days the weather cannot be accurately predicted. Perhaps you’d be interested in my post on Winter in Mallorca. As usual many, many thanks for the invaluable E-mails with incorporated articles which we greatly enjoy but with this one on Mallorca I just could not resist this reply. My wife and I have just returned from the island and stayed in Cala Mondrago; what a beautiful place with two beaches, two small hotels, beach bar, small shop and beach restaurant, all set in a natural park area. One might think it potentially to be isolated; not so as there is a limited bus service which takes you to Cala Barca, Porto Petro, Cala Egos and ultimately to Cala D’Or. From Cala D’Or you can catch further buses to Palma etc. We love the beauty and tranquillity of Cala Mondrago where the wildlife get so close. There is also a riding school nearby for those wanting something different and there are bird watching paths and shop on the approach to the resort. The two hotels are small with only 45 rooms in each and are comfortable. Highly recommended. Thanks Vincent … Cala Mondragó is indeed very beautiful. Hopefully your praise for the area and practical information will encourage other readers to give this lovely part of the island a try. Your trip pretty much mirrors my cycle in Aprill 2016. Breathtaking, seriously worth the tour. I am going again in October and intend to do the ride in three days, a day less than the last timeI did it. Some have done the tour in one day. I imagine that this time when I begin the ride, I will take notes and lots of photographs and will myself try and report back to this site with my recommendations. Thanks Vincent … have a great time and I’ll look forward to hearing back from you.